The Victory Cup event as it has been played since 1947 and therefore has developed a long history, currently held by SYC the Victory Cup has been previously won by RBYC, RGYC, RMYS and MYC and we'd love to see involvement from more clubs again. Past Commodore, Life Member and past Victory Cup Champion Trevor Neate is our MYC rep and if interested to play please contact Trevor on 0414885215. Sent to: all access groups (excl. public). For the past 5 years VIODA holds a very special girls only weekend. 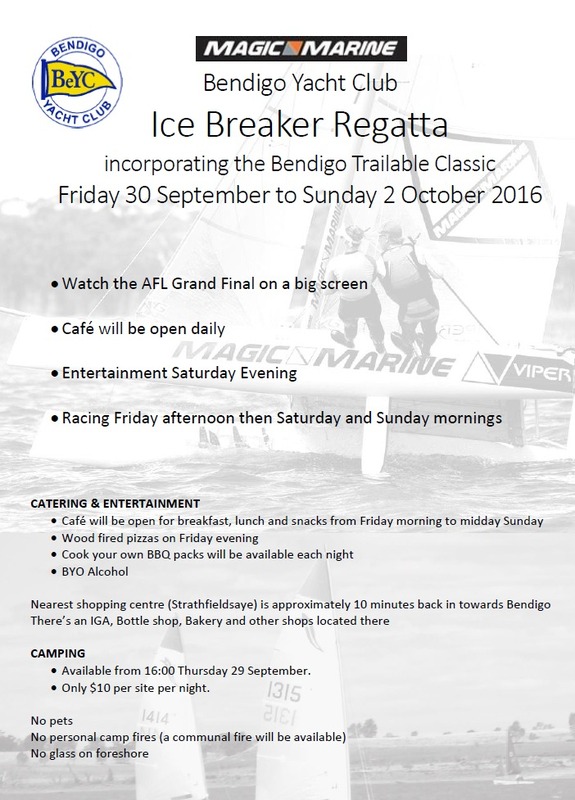 If you have a daughter who is in Tackers Squad, Green, Intermediate or Open fleet this is your weekend to make more sailing girlfriends in the fleet. BYO: Sleeping bag, pillow, Optimist and a smile. Want to be a part of the VIODA Girls Weekend? Please email viodacommittee@gmail.com to register interest. Female participation in sport noticeable decreases as girls become teenagers, however retention rates increase where the girls have a strong friendship base in their sport. VIODA is lucky to have girls aged 7-14 so we have a unique opportunity to create a girls camp to give the girls every chance to find sailing girlfriends. Now in its 5th year, the VIODA Girls Weekend is a proven success with near 100% success rate with girls staying in the sport and transitioning to a youth boat or participating in Senior School Teams Racing. Many of the girls who came to this weekend have paired up in double handed boats with friends made at this camp. In the 2014/15 season VIODA has 43% female participation in the fleet which is amazing and something we would not have thought possible 5 years ago. The content from every Team App is managed by each Team App's administrators. If you have any questions or concerns please contact your Team App administrator. A great day was had at MYC yesterday with the boys from Wugularr School! Yesterday, 2 boys from Wugularr School along with Henry & Kylie Heron, Lynne Sunderland & Steve Bolton ventured out for a boat trip here at MYC. Leshawn & Deon (both aged 10) are from the Wugularr School in the Beswick community about an hour east of Katherine, NT. They are here along with 18 other kids & 4 teachers for Wugubank week where the Penbank School community gather with our friends from the Wugularr School. This is the first time the boys have been to see us but Henry has been lucky enough to have visited the Wugularr School to stay twice over the past two years. There is no doubt that Wugubank week enriches all involved and at Penbank we believe that our authentic relationship with our Wugularr friends truly supports “reconciliation in action”. H​aving been at school all day, the boys were very excited at the prospect of venturing out on a boat - and before we had even launched the RHIB, they had commandeered Frosty and taken her for a good spin on the trailer! With the help of the 3 boys, we moved a few RHIBs around and eventually put Racer X in the water using the crane. The boys experience with boats is very minimal - one having been on a boat once, the other - never. All aboard! The three boys, Lynne, Kylie and I motored out of the harbour in glassy, sunny conditions whilst looking at a couple of the keelboats still in the water. It was agreed amongst our crew during a quick meeting that the steering wheel on Obsession needed to be so big ‘maybe because his eyes weren’t so good’! We motored off to the end of Mills beach, took in the sights and studied the bottom of the bay right in close - looking for fish and other creatures. We saw a few fish, and 11 armed Sea Star and a school of fish being chased by gulls. Henry Heron - an old MYC salt - was my fantastic first mate for the afternoon and assisted with launching, retrieving, tying up the RHIB, making sure the boys had their PFDs on and letting them know things whilst we were ‘at sea’. Well done Henry! The afternoon was truly rewarding for all on-board, and as part of Team MYC I was very proud to have been able to help these boys realise one of their dreams in our magical part of the world. Thanks very much to the Club for their generosity and making this adventure possible for the boys from the Wugularr School. We are writing to you today as the 2016-17 sailing season is rapidly approaching. Here at Ronstan we've noticed many boats in Australia have mainsheet traveller systems that could do with replacement and September is the perfect time for people to start tinkering with their boats, spending time at the club and getting excited for the upcoming season. We have an exciting offer for you; should you choose to purchase a mainsheet traveller system for your boat through our Septraveller promotion, you can deduct 25% off the RRP price and enter into the draw to win $1000 RRP worth of Ronstan Gear. Ronstans' Technical Specialists can even assist you with your specification for a new system! Welcome Paul Gray to Mornington and to Mornington Yacht club and please make Paul welcome and find out how Paul can assist you financially . FIIG Securities Ltd (FIIG) is Australia’s largest independent fixed income specialist. Fixed income is an asset class that offers investors capital stability and known, regular income via access to Australia’s bond market and, for that matter, to the global bond markets specifically in the USA, Europe and the UK. Retirees, people with self-managed Superannuation Funds and Investors generally, can buy a wide range of Commonwealth Government, State Government and Corporate bonds through us which will give them safe, reliable returns and high cash-flow income for many years ahead. I’m sure many of your patrons would be interested in doing a lot better than the 1-2% interest rates they currently get on deposits from their banks? For our next ladies lunch we have Dermal Aesthetics Laser Clinic, Mornington coming along to share their secrets on the best ways of keeping our skin healthy - including Blood Injections - the HOT NEW Beauty Treatment! Bring your friends down for a Rocks "special" lunch to listen to the chat & collect a "goody bag" - what a great way to spend a Friday afternoon! ​Ladies Sailing Shoes from Sport Phillip Marine will also be on display for you to consider for the upcoming sailing season. Membership fees were due by the 31st of July - a BIG thank you to those of you that paid on time & also to those of you that paid after receiving a reminder call recently. If your's is still outstanding it would be very much appreciated if you could organise payment straight away. Please note that the club is considering adding credit card merchant fee's in the near future so you may wish to pay before this commences. ​We do offer a monthly payment scheme - if this interests your of if you haven't received your renewal please contact Sarah at the office on 5975 7001 or by email - thank you! Our new deck is coming along nicely, we will be enjoying the sunshine and BBQ'ing on it by October! We are holding a yard working bee on Saturday the 3rd of September from 9am to 1pm. If you are free and can help us we will reward you with a BBQ & Beer afterwards! Thank you - there will be a list of jobs on the day, all help is very much appreciated. Rob Rainsford in Sailing Paradise. Photos thanks to Kellie Knowles. She wrote "Jealous?" Thought I'd let you know that we ( Paul Dynes, Warren Neate & Christine Cooper) joined the crew on Senga ( beneteau 42.7s) all female crew from Port Douglas and finished up 5th for division 2 overall for the regatta. Great 6 days of racing!! Hot off the press...the Rocks win the Best Seafood Restaurant of the year in Victoria & Tasmania for the 2nd year running! Congratulations to Rob, Lisa and Team on winning the "Best Seafood Restaurant of the year in Victoria and Tasmania" for the 2nd year running! - a fantastic result, we are very lucky here at MYC to enjoy this amazing food! Last nights event was a great success! The Charity Film Screening for the Bays Special Care Nursery was a great success! With approx 160 people attending and an amazing $17,000 raised! The Rocks put on a fabulous menu and the screening at the Mornington Cinema was fantastic. Harcourts Mornington donated $3,995.00 for a phototherapy machine & they also received an anonymous donation of $2,000 from a past patient! Mornington Yacht Club are very proud to have been part of the night and to have this wonderful association with the Bays Hospital. A big thanks to the hospital volunteers for their back up support which ensured the smooth running of the event.